Looking for a Used XTS in your area? 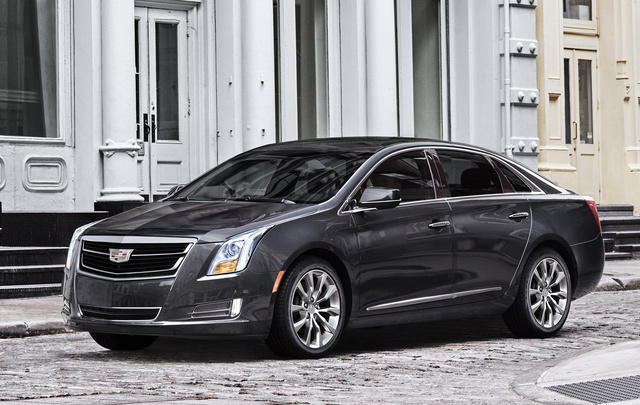 CarGurus has 5,839 nationwide XTS listings starting at $8,495. The Cadillac XTS full-size sedan is slated to gain a number of upgrades for the upcoming model year. This plush 5-passenger people-hauler is a favorite with limo services, but its touring-oriented ride has popularized it with affluent commuters who like to show off on the drive to the office. A rumor has surfaced, however, that Cadillac is set to phase out the XTS once this generation runs its course, with a spokesman for the Detroit automaker citing a desire to appeal to a younger consumer. In any case, a number of changes and upgrades to standard and optional equipment in the 2017 XTS have been confirmed. Three new exterior color choices are on tap: Phantom Gray Metallic, Deep Amethyst Metallic, and Bronze Dune Metallic. Additionally, the CUE infotainment system is upgraded with a Collection feature for adding various apps and a Teen Driver enhancement that’s similar to Ford’s MyKey programmable speed- and audio-limiting system, designed to encourage safe habits in young drivers. Further improvements for the upcoming model year’s XTS stable also include an enhanced Base Cluster with updated graphics definition in its 12.3-inch display and newly standard 20-inch Sterling Silver premium pointed alloy wheels on specific trims. Expect the XTS to return in 4 trims, with the “Collection” designation deleted for 2017. The current Base trim will simply become the XTS, and the Premium trim is expected to be renamed the Premium Luxury. Thus, the 2017 XTS lineup should include the entry-level XTS, the Luxury, the Premium Luxury, and the top-shelf Platinum. The new Premium Luxury trim and the flagship Platinum edition will also remain available in a V-Sport sub-trim that sports a twin-turbocharged V6 mill, standard all-wheel drive (AWD), upgraded wheels, and an electronic limited-slip differential. Meanwhile, expect the rest of the 2017 XTS lineup to again come with standard front-wheel-drive (FWD), with all iterations other than the base XTS remaining eligible for available full-time AWD. Based on a variation of the well-wrought Epsilon II platform, the 2017 XTS will doubtless keep its 18 cubic feet of trunk space. Look for the XTS stable to again offer a standard 304-hp 3.6-liter V6 LFX engine mated to a 6-speed shiftable automatic transmission that allows 264 lb-ft of torque. Mileage figures are currently estimated at 18 mpg city/28 highway/22 combined in FWD versions and 17/26/20 with AWD. Cadillac has made noises about replacing this standard drivetrain with an upgraded LFG powerplant matched with an 8- or 9-speed automatic transmission for the 2017 model year, but there’s been no further word about these upgrades thus far. In any case, the racy XTS V-Sport variant’s 3.6-liter twin-turbocharged V6 will churn out 410 hp and 369 lb-ft of torque under the management of the current 6-speed shiftable automatic. It should be noted that this force-fed powerplant uses only premium gasoline and that its mileage numbers are expected to remain a somewhat thirsty 16 mpg city/23 highway/18 combined. The 2017 XTS will again offer the usual range of standard luxury equipment and accessories, including alloy wheels, heated reverse-tilt mirrors, leather upholstery, heated power-adjustable front seats, full power accessories, remote engine start, cruise control, and power-adjustable telescoping tilt-wheel steering. The interior should also include a remote garage door opener, dual-zone automatic climate control, an auto-dimming rear-view mirror, and rear parking sensors. Higher XTS trims will again boast such extra niceties as a power sunroof, upgraded interior and exterior styling cues, a heated steering wheel, power-folding outside mirrors, front and rear parking sensors, a rear-view camera, and a massaging driver’s seat. Rear-seat audio and power sunshade controls, an auto parallel park feature, and the safety-oriented Driver Awareness package are also anticipated to return for 2017. Memory for driver settings, curiously, will no longer include a memory feature for passenger-side front seats. But this feature will continue to include memory for the mirrors, steering-wheel position, and climate control selections. In addition to the upgraded CUE infotainment system (with GPS navigation, standard on higher trims) technology in the 2017 XTS will again include Bluetooth-integrated OnStar telematics with 4G LTE WiFi hotspot capability. Lower trims are slated to sport a CD/MP3 player with 8 Bose premium speakers, satellite radio, and an auxiliary audio input. The Premium Luxury and Platinum trims, along with their V-Sport siblings, boast a 14-speaker Bose premium sound system. An optional rear-seat Blu-ray/DVD player with dual screens, wireless headphones, and a remote is also expected to return aboard higher XTS trims. Standard safety features for the upcoming year’s XTS lineup are expected to include 4-wheel antilock brakes (ABS), traction and stability control, front and rear side-mounted airbags, front and rear head curtain airbags, daytime running lights, OnStar emergency communications and alerts, and turn-signal-integrated mirrors. Further standard safety equipment includes adaptive high-intensity-discharge headlights, a post-collision safety system, and a remote antitheft alarm. Look for the Premium Luxury and Platinum to again boast the Driver Assist package, with lane-keeping assistance, blind-spot monitoring, a forward collision alert, and a vibrating safety-alert driver’s seat as standard equipment. The National Highway Transportation Administration (NHTSA) gives the 2016 XTS lineup 5 out of 5 stars for overall safety, while the Insurance Institute for Highway Safety (IIHS) also awards the Cadillac its highest score of Good on all tests. Rivals like the Chrysler 300 and Hyundai Genesis will challenge the 2017 XTS in its price niche; Audi’s A6 and Mercedes-Benz’s E-Class each provide a midsize, and pricier, alternative. What's your take on the 2017 Cadillac XTS? L G Very happy with 2016 XTS Premium model. Used to drive Lincoln MKS. Caddy is better in many small ways, not initially apparent but ultimately palpable. TheHorror An AWD XTS is a great car for $40k. It is much less appealing at MSRP. Have you driven a 2017 Cadillac XTS? The car without one and there are sooo many bells and whistles I need help.